I always loved writing. Two years back I took a step forward and brought together my two favourite hobbies - experimenting in the kitchen and writing, which gave birth to my blog - Apy Cooking. Till then, I was a happy cook, usually satisfied with my experiments (more with the process than the result). And then I became thirsty. I wanted to do more. There was this urge to emulate various food bloggers. I wanted to make bread, cakes, decorate them, I wanted to fuse food of different cultures. I started getting hunger pangs for bigger challenges. I wanted to make 3D cakes, I included non veg dishes in my cooking, I made fondant at home. 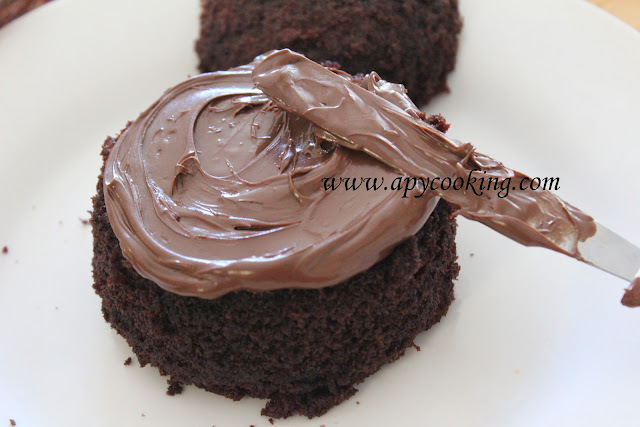 Results mattered more than the process and Apy Cooking became a passion than a mere food blog. And then it was time to leave, to bid adieu to my kitchen in sunny Sunnyvale. Bags were being packed, boxes were getting wrapped, and in the middle of all this, my heart was longing to make something very special for my dear food blog. A doll cake. Seriously?? Just a week left to pack up and relocate to India and I wanted to make a doll cake?? Yes, I did. So I unwrapped the homemade marshmallow fondant, whipped up two small microwave chocolate cakes, drenched them with yummilicous Nutella, spread rolled fondant, dressed up the doll and took pictures like my tail was on fire. I was amazed at how fast I could actually make something and take pictures, much to the surprise of my husband who always claimed I spent more time taking pictures of the food than in actually cooking it. I was so tired at the end of it that all I wanted to do was plunge into the hazelnut frosted cake and take a big, fulfilling bite. 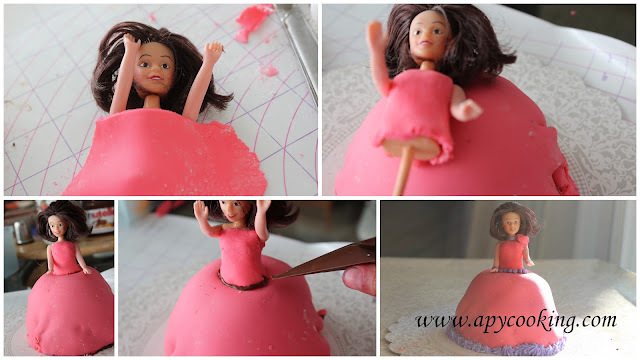 So here's how I made the doll cake. I looked up on the internet, ofcourse, for some ideas. I bought a small doll from Michael's (you can get a bigger doll for a bigger cake). I then made half recipe of microwave chocolate cake and poured the batter into two microwave-safe bowls, one larger than the other. I microwaved the cakes [ smaller bowl - 2 minutes, larger bowl - 3 1/2 minutes ], allowed to cool completely and inverted them. I then frosted with Nutella and placed the smaller cake on the larger one and frosted all over. I then took a small portion of marshmallow fondant (you can use store-bought fondant), dusted powdered sugar (u can use crisco) on the mat (fondant sticks easily to countertops, add more crisco if not using a mat, or stick parchment paper on the countertop), coloured the fondant and rolled it. 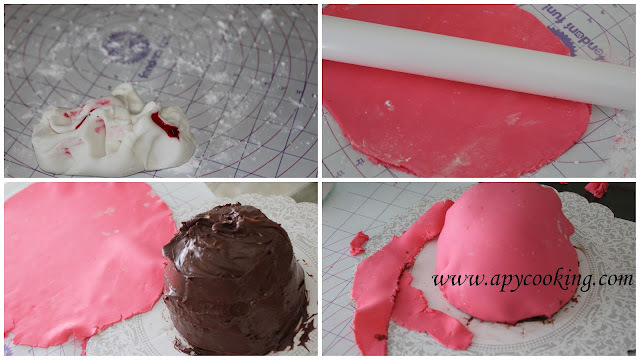 I then covered the cake with the coloured fondant and removed the extra bits. It was time to dress the doll. I do wish I had more time to make the dress a lot prettier. But the large carboard boxes were calling for attention, so I wrapped the poor doll in average "clothes" (thank God dolls don't speak), placed some beads made of fondant and piped buttercream stars on the dress. I did want to avoid using buttercream and wanted to make it all fondant. But just to be safe, I had a small jar of store-bought buttercream icing (thank you, Wilton). I'm glad I had it because Nutella, being brown in colour peeps through the clothes when you try to join two fondant bits. I got away with the beads on her waist, but for the neckline and the little rose on her shoulder (ahem, I'm not exactly a fashion designer), I used buttercream for binding. I was so happy and thrilled at the end to see the little doll in her pretty dress. 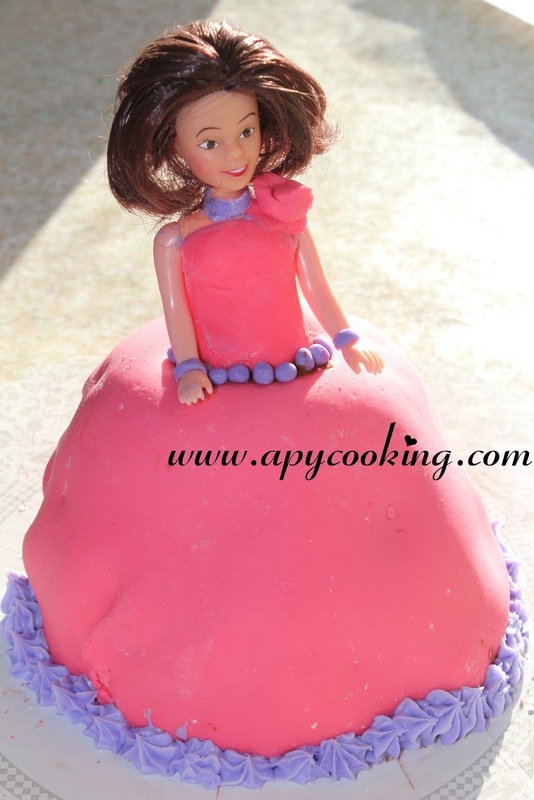 Reminded me of the time I had seen a barbie doll cake for a cousin's 5th b'day party. 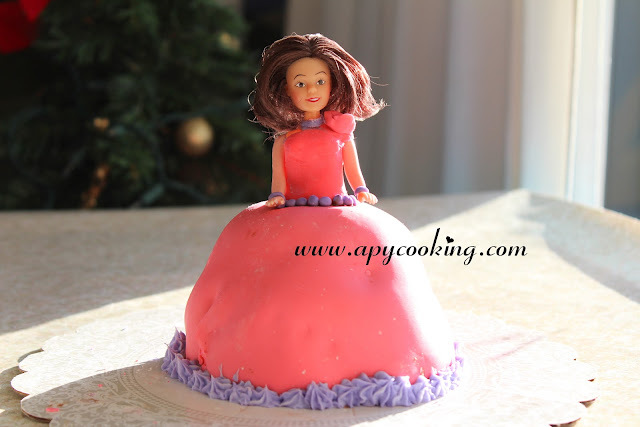 Though not as beautifully decked up as the Barbie doll cake, my little doll stood proud as we celebrated. Happy B'day Apy Cooking!! Not sure when the next post will be since we arrived only yesterday and have a lot of settling down to do, but until then dear readers, Happy Cooking!! 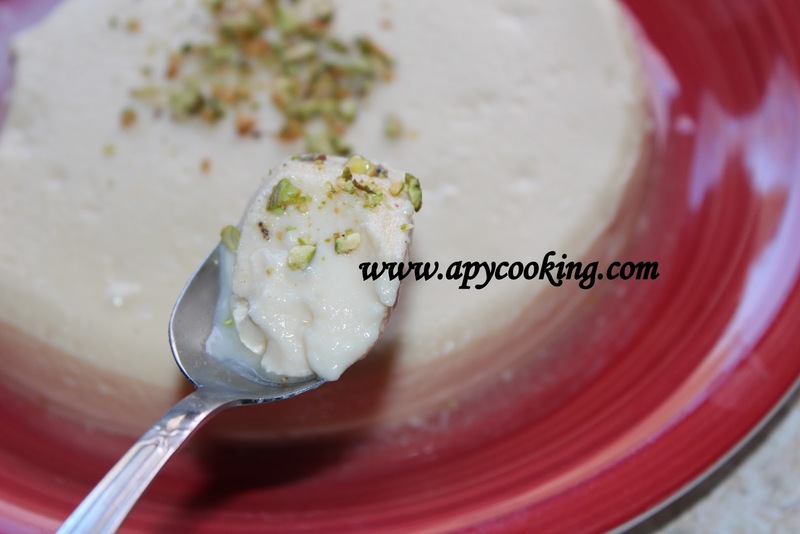 Whenever I make Mishti Doi, I always make a mental note to try this dessert in the microwave or pressure cooker so that I could share the recipe with people without an oven. A friend recently asked me if this dish can be made in the microwave and I was trying hard to find some time to experiment. 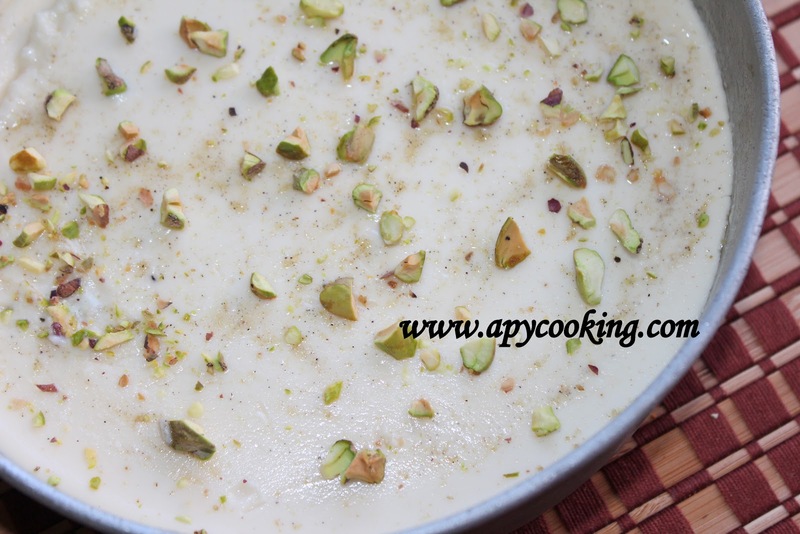 So imagine my surprise when I found a recipe for Bapa Doi in "Hawkin's All India Cookbook". 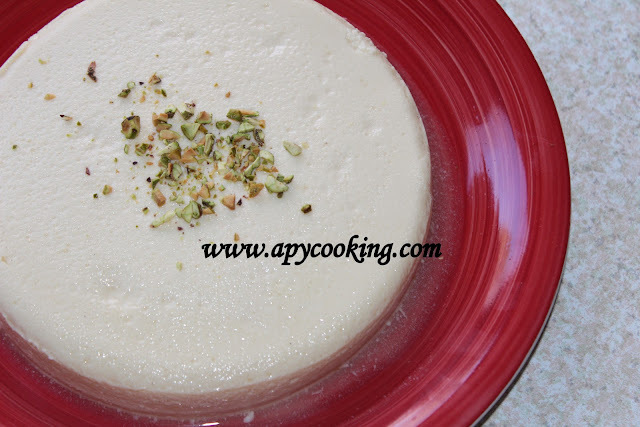 The recipe was very similar to Mishti Doi except that milk was used instead of evaporated milk and the dish was steamed in the pressure cooker as opposed to baking in an oven. Just like I haven't tasted the authentic Mishti Doi, I haven't tried authentic Bapa Doi either, but for now, I will just go by this book. I have made a couple of minor changes - the orginal recipe asks us to mix in some chopped nuts- almonds, pistachios and raisins, into the mixture before steaming. I did not add any nuts while steaming, but sprinkled a handful of chopped pistachios while serving. I also added some cardamom powder for an extra kick. 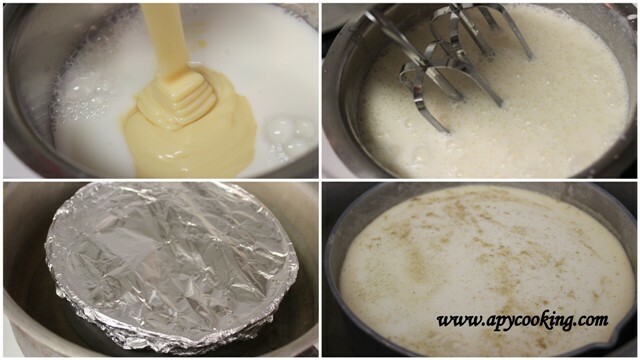 In a large bowl, beat together curd, condensed milk and milk. I used a handheld electric mixer. Beat for a few seconds till you see froth on top. Scrape the sides as you beat to make sure the ingredients have mixed well. Add nuts [I did not add] and mix well. Sprinkle cardamom powder (optional). 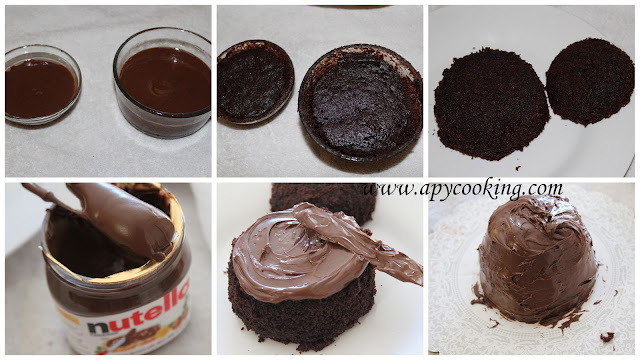 Pour into a 1 liter pudding mold or any vessel that goes in the cooker [ till 3/4th full]. Cover vessel tightly with grease-proof paper [I used aluminium foil]. Pour some water into the cooker. Place a grid or a perforated plate (plate with holes) into the cooker [this way the vessel will not tilt]. Place the vessel in the cooker. Close the cooker [do not put the whistle]. Turn the heat to medium-high or high and bring the cooker to full pressure, about 5 minutes. Reduce to medium low and cook for another 15 to 20 minutes. Remove from heat and allow the cooker to cool completely. Remove the vessel. Bring to room temperature. Refrigerate for atleast 3 hours, or until you serve. [Doesn't taste great at room temperature]. If you did not mix nuts while cooking, sprinkle chopped nuts on top. If you wish to invert the dish, place a serving plate on top of the vessel and invert. Pat lightly and gently remove the vessel. I personally found Mishti Doi sweeter and tastier whereas my husband liked Bapa Doi better. Either ways, the easier versions of both these Bengali desserts are a delight to make and are heavenly in taste!